Welcome to Kona Makai#1-301. The absolute best in the complex. You have outdoor Dining, while being direct oceanfront!! This is true paradise!! Look at how big the Lanai is!! Absolutely amazing. What an jaw dropping, gorgeous view. Views don't get better than this at the Kona Makai! Read a book, have a glass of wine, listen to some music, & most importantly: hear the ocean while you relax on this exceptionally large lanai! Beautifully Decorated Living Area of #1-301. Beautiful Finishes everywhere...the owner has taken spectacular care of the property. Look at that wrap around Lanai! Living area, peering into the beautifully remodeled Kitchen. Gorgeous, Fully Equipped, Remodeled Kitchen. Has everything you need!! WOW! A view of the water from the Kitchen?! How amazing is that?! Wonderful Direct Oceanfront Living in the Master Bedroom! High Ceilings. Master bedroom has a gorgeous direct oceanfront view! Hear the water while you're in bed! Enjoy a comfortable King Sized Bed! 2nd bedroom has 2 twin beds. These can be converted into 1 bed if the guest wishes to do so! As you can see the lanai continues to extend to wrap around the whole unit!! You not only have direct oceanfront views, but pool views too! More seating available on the Lanai! Gorgeous Oceanfront views from the Lanai! Hot tub for your enjoyment!!! Not a common amenity in the Kona area! Sunbathe at one of Kona's absolute premier oceanfront condominium complexes! Look at all of that outdoor dining space available in the common area! Direct oceanfront! The outdoor BBQ common area is a beautiful place to grill up your food! Tennis Courts available for your use! Ping Pong for your enjoyment! 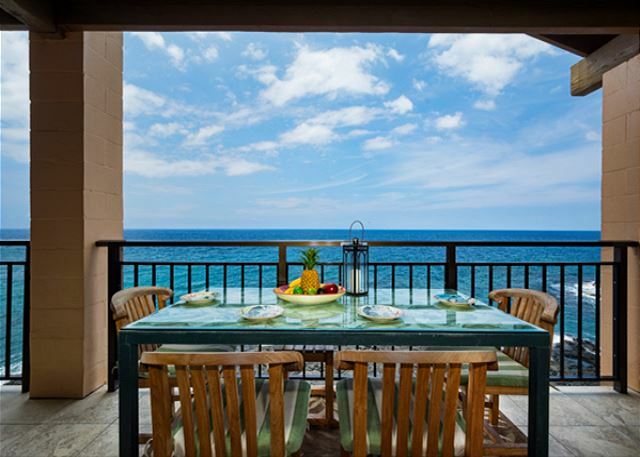 The Kona Makai is DIRECT Oceanfront! The amazing, very well maintenaned grounds at the Kona Makai! Book with us TODAY!! Kona Makai #1-301 is arguably the BEST condo in the entire complex! Being the top floor corner in building 1, the location is undeniably too perfect. Private & upgraded, this is direct oceanfront condo living at its finest. You can't get a better view than this at the Kona Makai. The amazing oceanfront wrap around lanai is truly stunning! The amazing view is not all that this condo has to offer; the elegant finishes and attention to detail can be seen throughout the interior of the property. Enjoy the beautifully upgraded & fully stocked kitchen complete with granite counter tops & stainless steel appliances. The master bedroom has ocean views and access to the wrap around lanai. The guest bedroom also has access to the wrap around lanai and both bedrooms do have AC units allowing for maximum comfort! Both bathrooms have been upgraded and well appointed. This condo truly has everything you'll need to relax in paradise! We're more than proud to be representing 1-301. The Kona Makai complex is a beautifuly maintained &highly sought after Ocean Front Complex located on famous Alii Drive, just 1.3 miles from Kona town. This wonderful complex features and includes beautifully manicured tropical grounds, ocean front pool and spa, sunny lounge area, two work out rooms, eating area w/ gas BBQ’s, tennis courts, ping pong table, ample parking, and is gated during the night for security. Fantastic view. The unit was private and quiet. We had everything we needed to cook meals which we then enjoyed on the lanai. So nice to get up and enjoy a cup of coffee and listen to the sound of the ocean. The air conditioners in the bedrooms made it comfortable for sleeping. Really enjoyed our stay and would definitely come back. This is our third stay in this unit at Kona Makai. We've been staying at this complex since the 90's but this is definitely our favorite condo. We spend most of our time on the lanai - you can't beat the views in all directions! We cooked at the barbecue area almost every night, played ping-pong almost every day and used the pool and hot tub daily. The grounds are beautiful and the resident manager and his team are great people and very responsive. The unit is fully equipped (thank you for the Brita filter pitcher!) and clean. We are looking forward to coming back again! We're so happy to hear you enjoyed another stay at Kona Makai 1301, Luanne! Sounds like you had a very Hawaiian vacation from lanai views and barbecue dinners. We'd be honored to help accommodate another stay for you again and look forward to hearing from you! Great location at Kona Makai! Best views & sounds of crashing waves! This is a fabulous property. Great lanai. Saw dolphins several times right out in front. The grounds were very well maintained. The road is busy to pull out onto, but we walked to the harbor several times and shopped and had lunch. The location is great. Would have loved to get an early check in, but no one returned my call about it. Other than that, it was a prefect vacation. Maintained complex with nice pool & hot tub. Very quiet community. The unit itself is nicely appointed with a well stocked kitchen with items you don’t always find in a vacation rental. Also the owners had beach towels and chairs you could use. Internet works well and the air conditioning in the bedrooms is a must. Visiting in June it was pretty hot & being able to cool the bedrooms was a plus. Really though the lanai alone made our stay. It is huge and we would see dolphins most mornings as well as turtles. We snorkeled right in front of the condo every morning. You have to get in & out via lava rock. IBut the snorkeling was great! Beds were comfy and plenty of towels. Washer & dryer was also nice to have for laundry. Would recommend & definitely stay here again. Management company did a good job coordinating when we arrived but did not have entry information. Another relaxed and recharging stay at Kona Makai oceanfront 301 unit. If you want more than 180 degrees of oceanfront, breaking waves, dolphin and even occasional turtle-viewing with your morning coffee, sunset dinners and waves lulling you to sleep each night - this is the unit for you. The pictures don't really do the actual view justice. I've stayed at 3 different units in Kona Makai - this one is by far the best unit. Great location on Ali'i Drive, nice property overall, direct access to snorkeling or swimming at your doorstep, cooking grills are oceanfront. Plenty of room for your family in the unit and balcony. Hawaii, what more can I say? The condo was great. The layout was fantastic for two couples. Each had a bedroom with a view and their own private bathroom. Both had access to the balcony through a slider. The kitchen was well stocked for cooking. The views are amazing. The complex has a nice pool and exercise facilities. Would I stay there again? Yes. This was our second stay at Kona Makai 1-301--our favorite unit at the complex. We love the location and the unobstructed water view, and already have plans for a return trip. While there were several minor issues upon our arrival, maintenance was dispatched and the problems were resolved within 48 hours. No complaints here! Love the huge lanai with the fantastic view! Property management delivered a new beach chair after letting them know one was broken…very nice. Such a great place. Was nice to have a home base in Kona. Condo accommodation were solid and the view was superb. Will be back for sure. The location is perfect, overlooking the ocean. Great patio. nice living area and kitchen. It was just right for our family of four.Close to town and restaurants. Quiet in the evening. Will stay here again. Overall it was a great unit and a great location. I fell asleep to the sound of the waves every night. We were right on the water. Beautiful, relaxing time. The whole complex was well maintained, quiet and in a great location. The unit itself was a little lacking in the quality of linens, pillows, beach chairs and water toys. Another wonderful stay in this condo! This was our second time in this condo, and our fifth stay at Kona Makai. The wraparound balcony is the star, and we spent the majority of our time out there. The interior is beautiful, too, and very well-equipped. Having the ping-pong table down in the common area was a bonus, and we used the pool and hot tub every day, as well. The complex is in a great location and we easily walked the mile-and-a-half into town and also did a nice four-mile run the other direction to Magic Sands Beach and back. We are looking forward to our next visit and will definitely book this unit! Outstanding views from wrap around lanai and ate many of our meals from there. Saw dolphins almost every morning. Can't say enough good things about the lanai! Also, very clean grounds and condo. Comfortable beds and good privacy between rooms. Would love to go back. A very pretty setting with a huge lanai to enjoy the view. There is no sand beach here, but many within a short drive. It's just an easy mile walk to the shops and restaurants. A perfect setting. The complex is remarkably quiet with mostly long term visitors and almost no children. The sound of the ocean and waves is soothing and drowns out everything. Even the hot tub was warm enough and the pool cool enough. Despite being less than a mile from Kona, there is no sense of the touristy craziness. The condo itself is spotlessly clean with great outdoor space, a good kitchen, comfortable furniture and very, very comfortable beds. While the decor may be a bit dated, it was exactly what we wanted for our short break. The only criticism we have is that the internet was absolutely useless. The complex has its own wireless but it cut in and out and even when working (which was usually only in the early morning) was impossibly slow. More often than not we had to resort to cellular coverage. If you need to stay in touch and/or get some work done, this wouldn't be the place. They either need to install their own wireless network (preferred) or a get booster for the complex's one. If you want to disconnect entirely, it would be fine. Beautiful 2 bedroom condo with sweeping ocean views from the the ginormous wraparound lanai. Privacy abounds there with unobstructed views. Kitchen was beautiful with black granite countertops. Multiple dining areas makes entertaining a pleasure. Comfortable beds and furniture. Worth every dollar, we will definitely return!